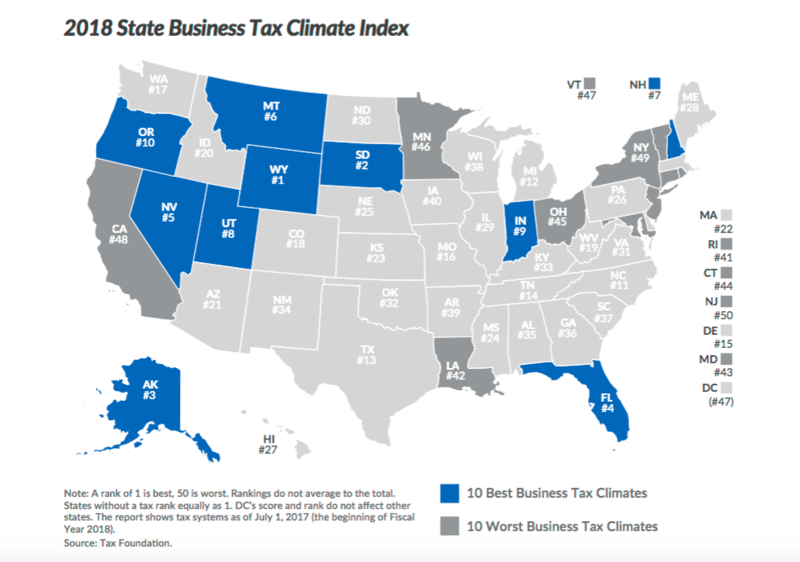 Connecticut slid backwards in the Tax Foundation’s annual ranking of states based on their business tax climate. Connecticut ranked 44th in the nation – one ranking lower than last year – and far behind Massachusetts, which ranked 22nd in the nation. Connecticut, however, did beat out New York and New Jersey. The report not only studies and weighs the effects of different state taxes like personal income tax, corporate taxes and personal property taxes, but also examines how the complexity of the state tax system affects businesses to find which states are most hospitable to business growth. The authors of the study note that “states’ stiffest competition often comes from other states,” a statement that has proven true for Connecticut over the past two years as major corporations such as General Electric and Aetna have moved their headquarters to neighboring states. Connecticut was listed as having a “comparatively high” corporate tax rate of 9 percent, equal to that of New Jersey. Connecticut scored especially low for its personal property tax, ranking 49th in the nation. Business owners have to pay property tax for the land on which their business is located, but also have to pay personal property taxes on the equipment they own or lease. Connecticut collected $2,774 per person in property taxes, based on figures by the U.S. Census Bureau. Connecticut was also ranked 37th for personal income taxes. In particular, the authors faulted Connecticut for having a bracketed structure in which people pay more taxes as they earn more, as opposed to a flat rate like Massachusetts. Connecticut’s top income tax rate of 6.99 percent kicks in after an individual has earned $500,000. The study notes that Connecticut was one of only three states that used “income recapture,” meaning that the top tax rate applies to all income earned before crossing the $500,000 threshold, resulting in tax penalties. Connecticut’s income tax revenue from its highest earners has been a point of contention throughout 2017. Connecticut’s budget deficit jumped dramatically when income taxes from top-earners came in lower than expected. Despite the declining revenue after having raised the top tax rate to 6.99 percent in 2015, government union leaders have consistently called on lawmakers to raise the rate again. Connecticut is heavily reliant on the top income tax bracket, and modest changes in those collections can result in big swings in state revenue. The analysis of Connecticut’s business tax climate by the Tax Foundation — and various others, including Forbes — disputes the findings of a report paid for by government unions earlier in the year, which purported to show that Connecticut’s businesses were under-taxed. State union leaders used the study to push for higher taxes on businesses in the state. Those findings were disputed by the Connecticut Business & Industry Association, whose annual survey of business owners found that 69 percent of those surveyed said the state’s high business tax rates were hindering growth.